There are two cleaning-related factors that can cause your leather to wear prematurely. The first is dirt, and the second is oil from your skin. The oil from your skin is actually the most damaging to your leather. This is particularly true when you wear shorts or a tank top, and have recently applied lotion or sunscreen to your skin. Take this into consideration when determining your cleaning schedule. Unlike fabric or vinyl upholstery, leather should be cleaned one section at a time. This means that once you have applied your cleaner or conditioner to one area, you should fully wipe down that area, and then proceed to the next and so on. Work on an area no larger than 2 to 3 square feet at a time. If you have a dark-colored leather interior, I recommend cleaning twice a year. Light-colored leather will need more frequent cleaning, even as often as every 3 months, depending on how readily the dirt shows. In between cleanings, use a clean, damp towel to wipe down the surface completely. This removes the dust and light soiling so it won�t have a chance to work into your leather. Apply the leather cleaner of your choice one section at a time, and work the solution into a nice lather with a sponge. If your leather is heavily soiled, use an upholstery (interior detailing) brush. When finished scrubbing, be sure to remove all soap from the surface with a damp towel. Rinse and wipe several times, and then dry the leather with a fresh, dry terry cloth towel. By the way, water will not hurt your leather. Most leather is actually made (tanned) in water. After your car's leather has dried, apply the leather conditioner of your choice. Choose a leather protectant that gives you the look you want (flat to shiny). 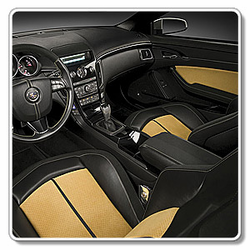 BLACKFIRE Leather Conditioner creates a nice matte finish on coated and noncoated leather upholstery. 303 Aerospace Protectant leaves a nice satin finish, but it should be used only on coated leather. Lexol Leather Conditioner is a well-known favorite that creates a glossy finish. 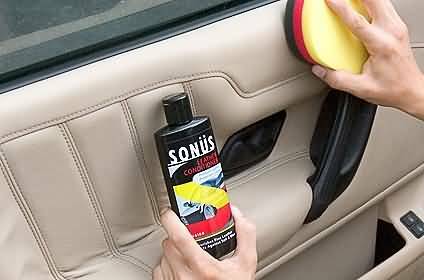 Apply cream based products like Sonus Leather Conditioner using a Microfiber Applicator Pad. Be sure to get the leather wet with conditioner and give it time to absorb. After a few minutes you can wipe away any excess with a soft, dry cloth. Your leather should look fresh and new, not slick and greasy. Just as in cleaning, apply leather conditioner one section at a time. Using a foam wax applicator, work the conditioner in thoroughly. Allow the conditioner to soak in 1 to 2 minutes, then buff off the excess with a dry terry cloth towel or microfiber towel. It's important to buff off the excess. If you allow the excess to stay, your seats will be slippery. After a few minutes of soak time, your leather has taken in all the moisture it can. The remainder will simply evaporate, leaving that nasty film on the inside of your windows. Simplify your search for quality leather care products with a complete leather care kit, such as the Polish Angel Luxury Leather Kit and Wolfgang Leather Care Cockpit Kit. Exclusive formula nourishes fine leather... Protects against soil & wear for lasting beauty!